An important part of our activity has been devoted to the study of small size ferroelectric systems. Device applications mainly concern memory storage devices for which reduction of energy operating costs and improvement of storage capacity are highly desirable and actively sought. Device operation crucially relies on the properties of electric polarization. The key point is that, in thin films and nanostructures, polarization behavior may strongly differ from that in bulk materials. We proposed multibit memory cells based on multiaxial ferroelectric thin film under certain temperature and strain conditions. We paid particular attention to polarization switching mechanisms. 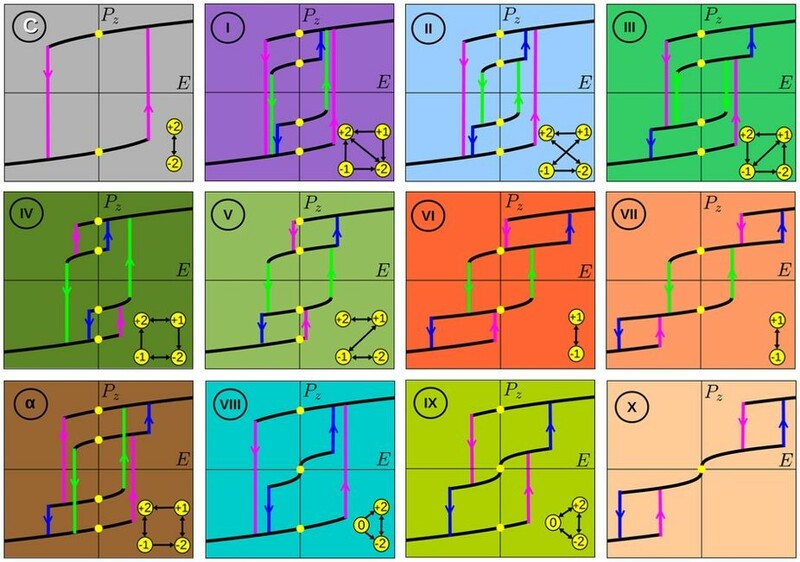 We have demonstrated the existence of different homogeneous switching regimes in strained thin ferroelectric films. In addition to the conventional longitudinal switching mechanism (for which polarization vector always keeps the same direction), other mechanisms involving the rotation of polarization are also possible. 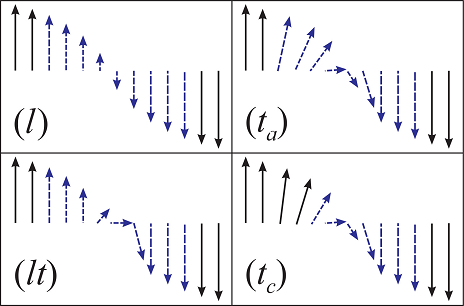 Different polarization reversal mechanisms are illustrated below and corresponding current signatures are shown in right panel. 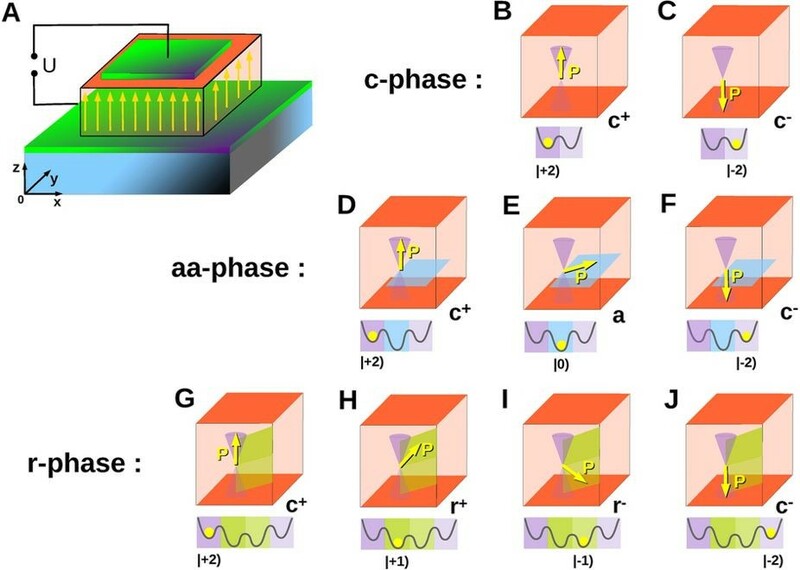 We have investigated the polarization-field dependence in ultrathin films and found behaviors very different from the classical hysteresis loop, with two opposite polarization states at zero field, which constitutes the basic cell of existing ferroelectric memory. We have demonstrated that by means of misfit strain and/or temperature, one can tune the shape of the polarization response to the electric field and induce exotic sequences of multistable states. That should enable to design ternary or quaternary memory cells. Such multilevel cells can be realized using ultrathin films of ferroelectric oxides such as the prototypical PbTiO3, which appears promising for room temperature operations. Multistable polarization states in the ferroelectric film. 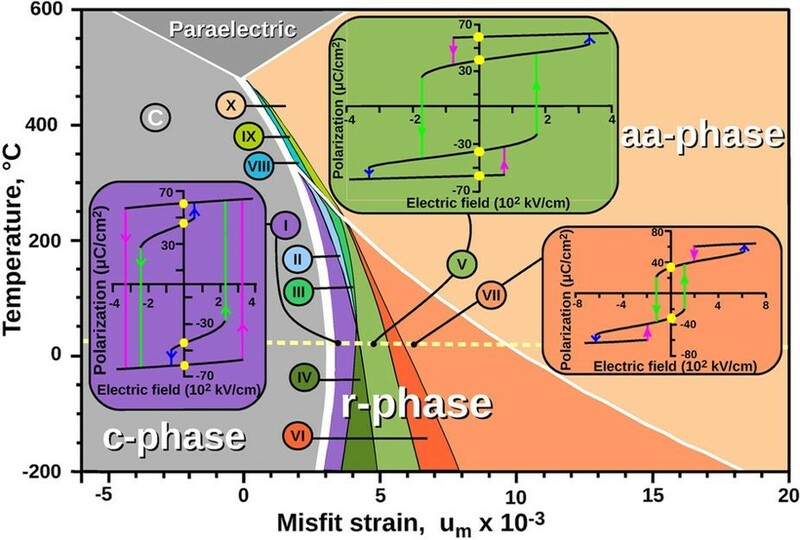 Misfit strain–temperature phase diagram of multibit switching regimes in PbTiO3 Ferroelectric Multibit Cell. The domains corresponding to different switching regimes are shown as color sectors. The insets display calculated topologically different 4-states hysteresis loops that are realized at room temperature (the room temperature is marked by the dashed yellow line).